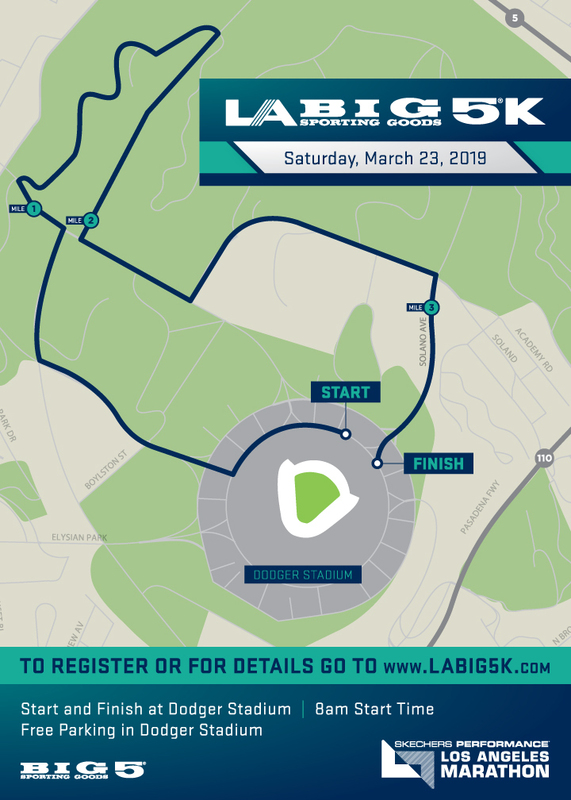 The 2019 LA Big 5K will take place on Saturday, March 23, 2019 at Dodger Stadium. The race will promptly begin at 8 am. Participants should begin lining up for the 5K no earlier than 7 am. Please seed yourself according to expected race pace - quicker runners at the front of the start chute, slower runners and walkers to the back. For those that will be walking with a stroller, please place yourself at the very back of the pack to minimize any disruptions of other runners. Due to street closures for the LA Big 5K, only two entrances will be open to Dodger Stadium for participants, the Sunset Gate, accessible via Sunset Blvd, and the Downtown Gate, accessible via CA-110. These gates will open at 6:00 am. Please allow yourself plenty of time to get into Dodger Stadium and pick up your race package before the start at 8:00 am. Participants may visit the Health & Fitness Expo for the Skechers Performance LA Marathon to pick-up their packet. Friday packet pick-up is encouraged, NOT required. Pre-registered participants can pick up their race packet beginning at 6:30 am in Parking Lot G at Dodger Stadium. Pick up your post-race refreshment and other goodies at the Finish Festival located in Lot G, just beyond the finish line. Finish Festival times will be released at a later date.